The most prolific Women’s Singles player this season will take on the world champion in the quarterfinals of the YONEX-SUNRISE Hong Kong Open 2018 tomorrow. Chinese Taipei’s Tai Tzu Ying, who has scorched the field this year with six World Tour titles, and world champion Carolina Marin – winner of two World Tour titles – face off after they won their second round matches yesterday. While Tai was taken to three games by Hong Kong’s Cheung Ngan Yi (17-21 21-16 21-9), Marin brushed aside the challenge of Canada’s Michelle Li, 21-14 21-8. Tai has a 6-4 record over Marin, and has won all their last five encounters – but the two haven’t played each other since January. The lower half of the draw saw Korea’s Sung Ji Hyun cross the second round barrier for the first time in four tournaments as she surprised India’s Pusarla V Sindhu 26-24 22-20. Sung faces China’s He Bingjiao, straight-games winner over compatriot Cai Yanyan, while in the bottom quarter, sixth seed Ratchanok Intanon (Thailand) takes on second seed Akane Yamaguchi (Japan). Another absorbing quarterfinal clash will be seen in Men’s Doubles, with top seeds Marcus Fernaldi Gideon/Kevin Sanjaya Sukamuljo (Indonesia) taking on Korea’s Lee Yong Dae/Kim Gi Jung. The two pairs have never met. Gideon and Sukamuljo won their third straight match over Denmark’s Mathias Boe/Carsten Mogensen, overcoming a first game deficit and outplaying the Danes 16-21 21-19 21-9. Lee and Kim, meanwhile, blitzed their younger compatriots Chung Eui Seok/Kim Dukyoung 21-15 21-14. The other quarterfinals will see Indonesia’s Mohammad Ahsan/Hendra Setiawan take on Denmark’s Kim Astrup/Anders Skaarup Rasmussen; China’s He Jiting/Tan Qiang against Japan’s Takeshi Kamura/Keigo Sonoda, and Indonesia’s Fajar Alfian/Muhammad Rian Ardianto against Chinese Taipei’s Lee Jhe-Huei/Lee Yang. In Men’s Singles, Indonesia’s Jonatan Christie earned bragging rights over his compatriot, Anthony Ginting, after losing the last two matches. Christie recovered from a near-hopeless situation in the second game, fighting back from 5-14 and three game points down to take the match 21-15 25-23. Christie faces the in-form Kento Momota (Japan), who had to come back from a game down against compatriot Kanta Tsuneyama, 17-21 21-17 21-16. Another Japanese, Kenta Nishimoto, made the quarterfinals in the bottom half, and he will take on India’s Kidambi Srikanth, who won a cracker of a match against compatriot HS Prannoy, 18-21 30-29 21-18. Kidambi saved four match points, while Prannoy saved seven game points before going down on the eighth. Another Indian, Sameer Verma, also made the quarterfinals courtesy a walkover from fifth seed Chen Long (China); Verma will play local qualifier Lee Cheuk Yiu. 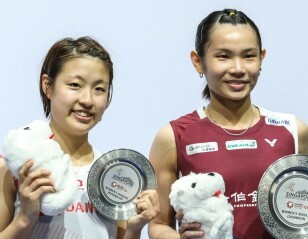 Three Japanese pairs – Yuki Fukushima/Sayaka Hirota; Shiho Tanaka/Koharu Yonemoto and Misaki Matsutomo/Ayaka Takahashi – made the last-eight, alongside Indonesia’s Della Destiara Haris/Rizki Amelia Pradipta and Greysia Polii/Apriyani Rahayu. Fuzhou China Open champions Lee So Hee/Shin Seung Chan (Korea) beat China’s Li Wenmei/Zheng Yu 21-15 21-16 to earn a quarterfinal against Thailand’s Puttita Supajirakul/Sapsiree Taerattanachai. Japanese qualifiers Takuro Hoki/Wakana Nagahara made the Mixed Doubles quarterfinals against compatriots Yuta Watanabe/Arisa Higashino. All England champions Watanabe/Higashino had it relatively easy over China’s He Jiting/Du Yue, 21-17 21-12. 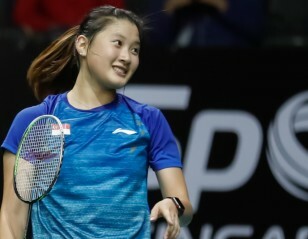 Second seeds Wang Yilyu/Huang Dongping overcame Malaysia’s Tan Kian Meng/Lai Pei Jing 21-11 18-21 21-6 and will run into Indonesia’s Praveen Jordan/Melati Daeva Oktavianti.